Sometimes – even when you have the skills, steady work experience, aligned career goals, similar cultural values – you don’t get the job. And no one tells you WHY. Sometimes it was nothing you said. Non-verbal cues, small movements, looks, and tones, gave your prospective employer pause about your ability to fit into their group or do the job well. What might these non-verbal communication cues be, and how can you eliminate or minimize them? Yes, IT/High Tech tends towards a casual dress environment. But in your interview you need to step it up a notch. Why? You want to show you’re serious about this potential job and have respect for those interviewing you. You will be far more (positively) memorable if you take a little time getting polished before your interview. At the bare minimum: shower, pay some attention to your hair, and dress in clean, well-fitting clothes. Even better: research the company and get an idea of their culture & dress code. 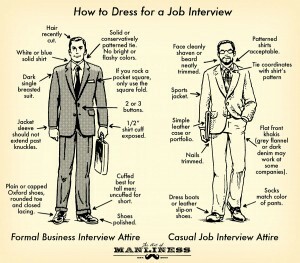 Use this information to determine the perfect interview outfit and style. Still not sure on what to wear? Play it safe and dress in standard modern business attire: This means slacks or a skirt, paired with a button down shirt or blouse. Need help decoding various business dress codes? Check out this article from the etiquette expert Emily Post. Show your interest, your enthusiasm, and your seriousness about this job not just through your words, but how you say them. Project warmth and confidence! What not to do: sounding sad, bored, or gloomy, could convey disinterest, a lack of confidence, or a negative perspective on the world. Arrogance, pushiness, and annoyance show disrespect & a lack of patience. People usually want to hire someone they won’t mind spending time with! Many people have differing levels of comfort when it comes to personal space. Some prefer to be up-close-and-personal, others prefer a lot of distance between themselves and the person they are speaking with. You might adjust your approach depending on who you are talking to, though a general professional level of space between you and the interviewer is preferable. What is that space? In an interview situation you want to keep at least 3 feet between yourself and the interviewer. And when it comes to touch we recommend a hands-off policy. The ONLY touching we recommend in an interview scenario is a good firm handshake. Anything else – you come across as overly familiar (even risking sexual harassment). You’re nervous for a reason – interviewing is an important activity, and something we hope not to have to do often. So we are uncomfortable with it. Like most things, the answer is “practice”. Don’t pass up an opportunity to interview, even on positions for which you may have only minimal interest. Having answered a myriad of questions many times over will help give you a comfort level that will sustain you through the important conversations. (And you never know what will come from the interview until you have it – the job, or company, may be an unexpected gem). Really want to feel sure of yourself before those interviews? You can practice at home as well: Tape yourself. Have a friend ask you interview questions and record how you respond. Review, take notes, adjust as necessary, and continue to practice at home, until you feel comfortable with your approach.